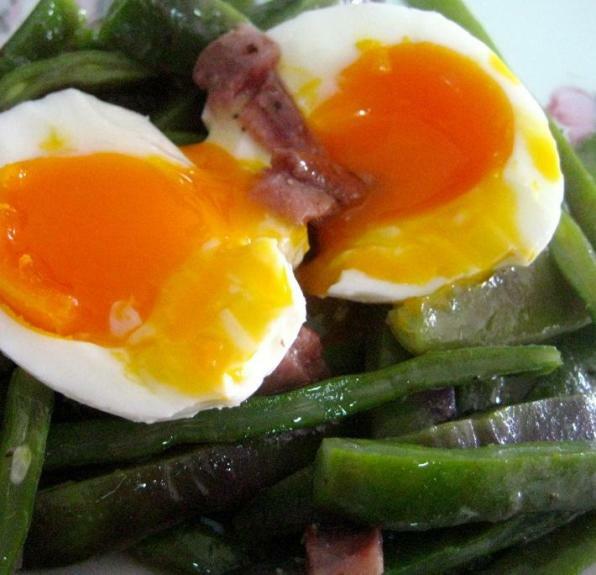 Boil the eggs for 6-8 minutes, depending on their size, until the yolk is creamy. This is very important. Wash and slice the beans into slices. Boil for 5 minutes. Meanwhile, prepare the vinaigrette with 1/2 tablespoon of oil from the anchovies, 1 tablespoon olive oil, 1 tablespoon vinegar and pepper. Select 3 anchovy fillets; these can either be left whole or cut into several pieces so that there is a piece of anchovy in every bite. Strain the boiled beans and add to the anchovies in vinaigrette. Mix gently. Lastly, distribute the bean and anchovy mixture on a serving dish and decorate with the eggs (cut open or left whole).